The BJP State Election Committee today drew up a panel of 23 names for as many seats that it will contest in the Punjab Assembly poll. The BJP will be contesting the same number of seats as in 1997. It had been claiming more seats. But eventually, following a meeting between SAD and BJP leaders, the contentious issues were sorted out and the “winnability” of a candidate was accepted as the basic criterion by both parties. The district unit of the General Samaj Party was launched here today. Party activists said they would fight to end caste-based reservation system and, if need be, establish a new reservation system based on the economic condition of an individual. Sadness was writ large on the faces of several truck owners and operators of Bathinda, Bhucho, Goniana and Rampura Phul as about 75 trucks that went up in flames at Udasar in Rajasthan on January 11 belonged to them. Information gathered by TNS revealed that about nine trucks were from Bhucho, 22 from Goniana and 44 from Bathinda. 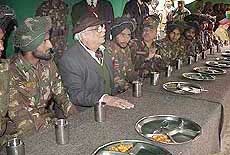 The Punjab Governor, Lt-Gen J.F.R. Jacob (retd), today celebrated Lohri with jawans deployed in the forward areas of the Dera Baba Nanak sector in Gurdaspur district. The Army Commander, the Corps Commander and the Deputy Commissioner received General Jacob.